As I was finishing up my round of golf today with the Core Group [in the rain], I was thinking about how playing golf with the same great group of friends every Sunday over the past 15+ summers was definitely one of my favorite things to do. On the ride home, I was thinking about what all my other favorite things were. And then I started to divide them between my favorite things to do, my favorite places, my favorite people, and my favorite items. It was fun every time another favorite thing popped into my head. And since my blog is for my grandchildren, I thought I would take the time to post my favorite things. I think your favorite things say something about you, and I’d like to give my grandchildren more than my opinions. I doubt if my postings will be regular, but I will try to keep up a nice pace of favorite postings. My first favorite thing is my journal. 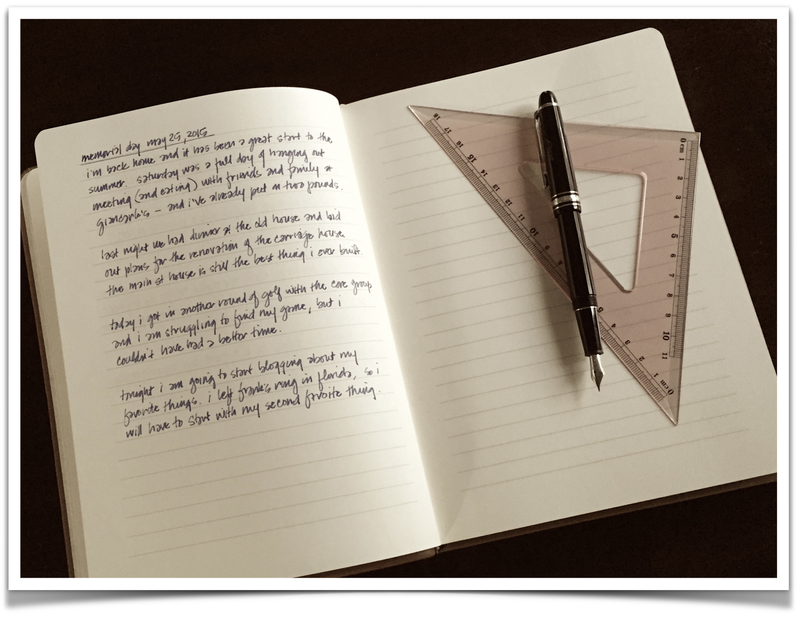 I thought it would be a great place to start since it is not only one of my favorite items, but writing in my journal is also one of my favorite things to do. I definitely have the Jesuits to thank for my journal writing habits. In high school, they encouraged us to keep a journal. They said write it all down – and then from time to time go back 6 to 8 months to see how it all looks and how it is all turning out. Today I have a stack of journals chronicling my adult life. If anything, I have been too frank, but my entries truly detail both the events and emotions as they were unfolding in my life. Seldom do my recollections match my journals. The good news. however, is that my recollections usually accentuate the positive and eliminate the negative [which makes for great memories]. I think I have recommended keeping a journal more than any other bit of advice that I have dispensed with over the years. 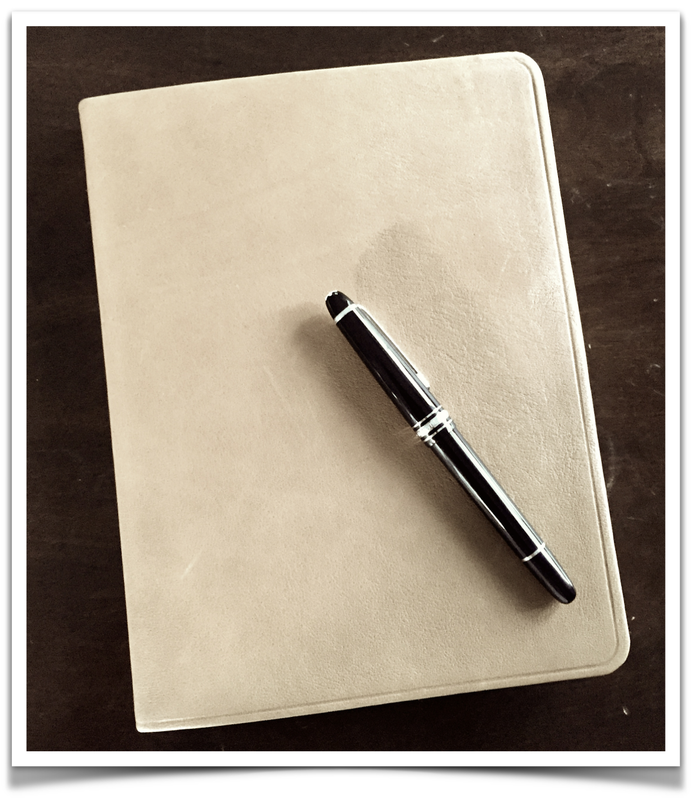 And for the past 15 years or so, I have used the same leather journals that I often gave to friends, business associates, and family as Christmas gifts [before technology made handwriting nearly obsolete]. I was originally given one as gift, and it was a Tiffany’s journal. So we hunted down the manufacturer, and Pam talked them into selling us the same journal [in the same blue leather]. Eventually I switched to a calfskin leather, and it gives me great pleasure to pick it up, open it up, and write in it nearly every night. Give it a try, it might become one of your favorite items and one of your favorite things to do.